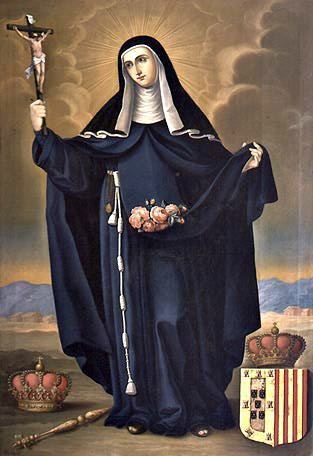 St. Elizabeth of Portugal was born in 1271. Elizabeth came from a very religious family, her great aunt was St. Elizabeth of Hungary. Her father, Pedro III would be the future King of Aragon. At a young age Elizabeth was self-disciplined and pious, praying the Divine Office daily, attending daily Mass, fasting, and performing other acts of penance. At age 12 she was given in marriage to Denis, King of Portugal, who was know as the “Farmer King”. They were later married five years later in 1288 when she was 17 and Denis was 26. Even as Queen she was able to grow in her faith and piety. She was quick to befriend and help all those with whom she came in contact while remaining devote to her husband, who was unfaithful to her causing scandal and children out of wedlock by multiple mistresses. King Denis was the focus of her prayer and charity and eventually gave up his sinful ways. One event which is said to have helped in bringing about the King’s conversion is when he believed a lie told about Elizabeth and one of her pages. The lie was told by another page that was of jealous of Elizabeth’s page. The King was greatly angered and arranged for the death of the innocent page by a lime-burner who was ordered to throw into his furnace the first page that was sent to him. The innocent page was sent to the lime burner but on his way stopped for daily Mass. The first Mass had already started so he stayed for a second one. During that time the King sent the page who had falsely accused the innocent page to find out what had occurred. The lying page was the first to arrive and was thrown into the furnace and died. When the King found out what had happened he realized that God has saved the innocent page and punished the lying page. Elizabeth was proven to be innocent. This event greatly affected the King and was a catalyst to his conversion. Elizabeth was also a great peace maker brokering peace on a number of occasions. In 1304 Elizabeth and King Denis were able to bring peace between Ferdinand IV of Castile and James II of Aragon. Castile is a region which is now modern day north central Spain. Ferdinand IV was Denis & Elizabeth’s son-in-law married their daughter Constance, and James II was Elizabeth’s brother. Also it is said that Elizabeth brokered peace between her husband and son when she mounted herself on a mule and rode between their opposing armies in order to prevent combat. A civil war had started in 1322 when Alfonso IV felt passed over by his father for the favor of the Kings illegitimate son Alfonso Sanches. Peace was finally returned in 1324 once the illegitimate son, Alfonso Sanches, was exiled, and the Alfonso IV swore loyalty to the King. Alfonso IV later became successor to King Denis. King Denis had become ill and died in 1325. Elizabeth never left his side except to attend Mass. After the death of King Denis Elizabeth retired to a monastery of Poor Clare nuns which she had built 11 years earlier in Coimbra, Portugal. She joined the Third Order of Franciscans and devoted the remainder of her life to the poor and sick in relative obscurity. But again in 1336 she work to bring peace again to warring factions. This time between her son Alfonso IV and his son-in-law, Alfonso XI of Castile who was married to Alfonso IV’s daughter and Elizabeth’s granddaughter Maria. Alfonso XI had neglected and mistreated Maria. Elizabeth was able to arrange peace terms between the warring parties. But after this effort she became ill and with a fever died on July 4th, 1336. 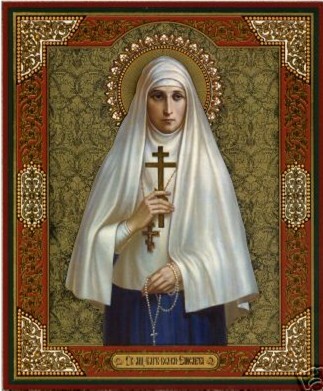 Miracles followed her death and she was beatified in 1526 and later canonized in 1625 by Pope Urban VIII.